Stirring up Fun with Kidstir! I feel triumphant! Actually my kids do, but it is rubbing off on me! They’ve just finished back to back performances at their school talent show and are as school-famous as the best of any tween heartthrobs. Their boy band- the Awesome Steamed Vegetables-is about to be selfie mobbed by hoards of screaming little girls and boys who think they are the absolute bomb! It’s a proud mama’s dream. My twin boys are in 2nd grade this year. They’re a bit shy so I’d been thinking of how to get them more comfortable in front of others. When our annual talent show came around, I knew the answer was here. I spoke to the moms of some of my kids’ friends and voila, a boy band was born! My son’s friend was a big fan of a singer called Parry Gripp, raving about his YouTube videos. So when his mom, my friend and Kidstir teammate Michelle, heard Parry Gripp’s song I like Vegetables, she was ecstatic. She shared her find with me and we knew this would be the perfect song for our little guys who like music, dance, and to goof around with full 8 year old gusto. 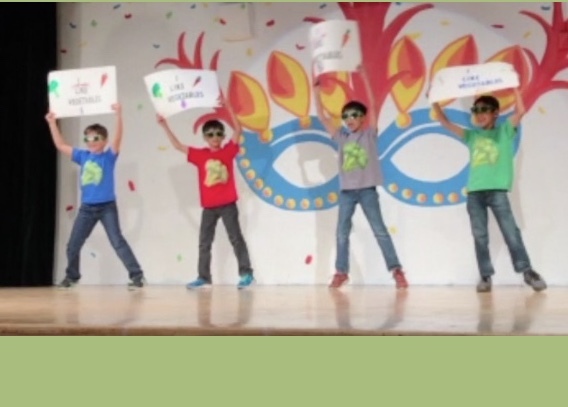 And, their moms are all about Kidstir’s mission of healthy fun, so of course, the I Love Vegetables message was on-point! For those of you who are just getting to know Kidstir, our hands-on cooking kits for kids were designed for families to stir up lots of fun together in the kitchen. This sparks a love of good food in kids that will provide dividends for years to come! You can read more about our team and products on our About Us page. Ultimately, I couldn’t have predicted a better experience and encourage any and all of you to run with this talent show concept yourself. First of all, the song is awesome and lends itself perfectly to boy band choreography. But even more so, I love that it’s filled with a positive message presented with a wink. It’s not so earnest as to be boring but also not bad just to be cool. When you see the lyrics below you’ll see why it’s really the perfect way to celebrate food, fun, and friendship! So who’s in the band and how did it come together? It’s my twin boys Xander and Zack and their buds Zach and Lee. We found adorable broccoli t-shirts on Amazon that are perfect as a costume, and can also live on in their wardrobes through the summer. Add some rapper necklaces and matching baseball caps and dunzo. We broke the song into sections based on the verses, each kid picked one and the boys decided together what dance move they wanted to do for each section. And yes, they chose that fabulous group moniker the Awesome Steamed Vegetables themselves! So enjoy the show, and if you’re looking for a way to make healthy choices a normal and cool option for your kids, this song is the perfect addition to your parenting bag of tricks! 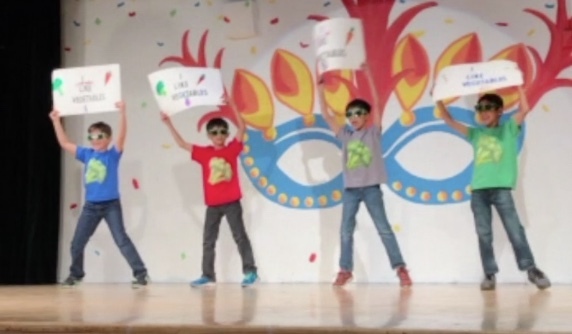 Our talent show performance video is up top. Below is the original song and artist Parry Gripp performing “I Like Vegetables”, along with the awesome lyrics. You think you’re tough? You think you’re hard?